Bialetti Brikka is a unique stove top espresso maker that makes it possible to prepare espresso with “crema”. This new style Brikka even got better - the maker now features an opening in the lid that allows the condensation to escape. This way no, condensation will drip back and dilute your espresso experience. Simple and genius. Enjoy your drinking experience with Bialetti Brikka coffee. 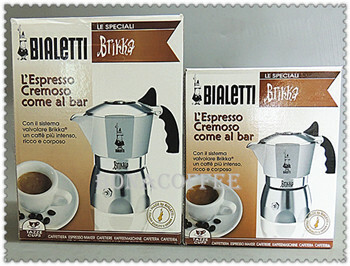 The bialetti 'Brikka' is a Stove top espresso maker that makes it possible to prepare espresso with “crema”.